This close-knit family enjoys their charming yard where lovely flowers and special treasures surround a fairy-tale house. A bubbling fountain and comfortable seating make the courtyard a nice place to visit with friends and neighbors. One day while driving through Homewood, Alabama, JoAnna Sasnett saw a delightful house for sale. She immediately called the real estate agent and sat in the driveway until the agent arrived. They walked through the home, and the rest is history. The stone house, built in 1927, resembles a small castle, so JoAnna and her husband, Gary, decided to surround it with an English-style garden. 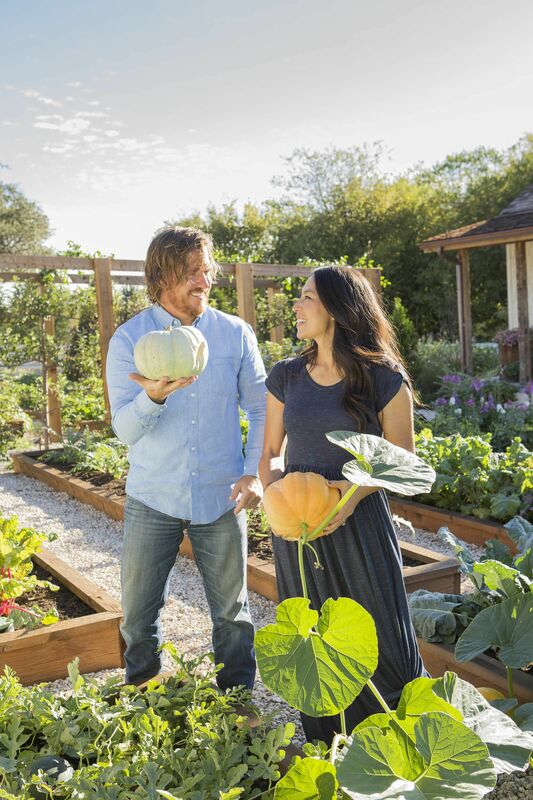 While Gary immediately started updating the interiors, JoAnna kept her eye on the front yard. She looked through books and magazines for ideas that could be incorporated into the new landscape. After about a year of living in the house, the family gathered to start landscaping. Gary and sons Jonathan and Brandon laid flagstone, building a neat little terrace in front of the house. They also planted a hedge of boxwoods to screen the new patio from the road. The whole garden began to revolve around the terrace. 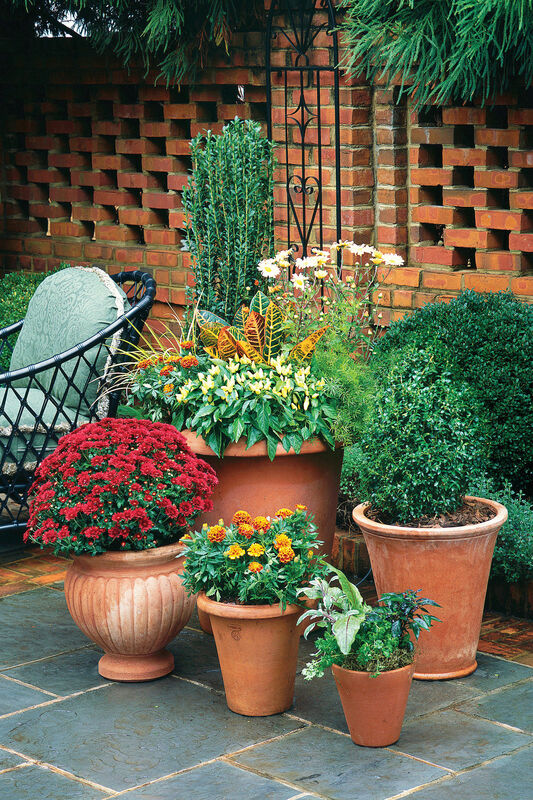 JoAnna consulted garden designer Charlotte Rose, who suggested using lots of colorful flowers and foliage. JoAnna bought the plants and set the pots out in the beds, looking at each one for a while to make sure it was in just the right spot before planting it. Today, the small beds are full of showy flowers, but foliage plants are key to the garden's success. 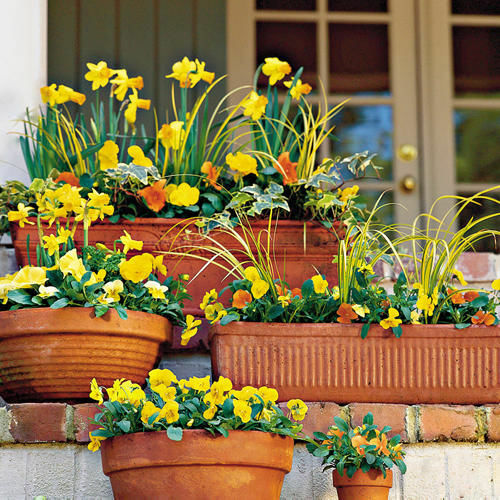 Plants with unusual leaves, such as lamb's ears, cannas, coleus, hostas, and ferns, add texture and form. They hold the garden together when the flowers fade. 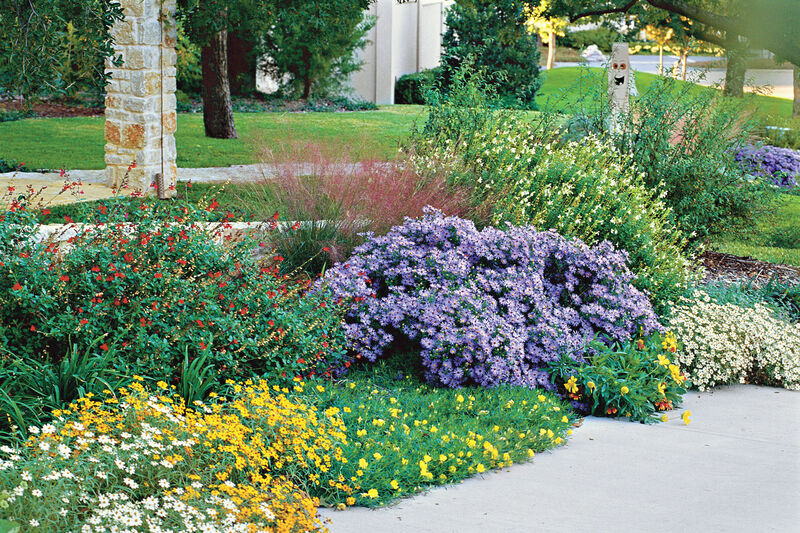 Blooming perennials such as summer phlox (Phlox paniculata), black-eyed Susans, lilies, and coneflowers also thrive here. JoAnna especially enjoys her pass-along plants. Sedum from her mother's yard and iris and daylilies from her grandmother's garden form tidy clumps around the terrace. Daughters Michelle and Elizabeth share plant-maintenance duties, often assisting JoAnna in planting, watering, and weeding. They like to learn plant names and pick the blooms. The family always displays fresh bouquets in their home and gives cut flowers to neighbors. Gary loves building and likes using salvaged items to personalize his work. He designed and constructed the unique bench that is pictured. Old English corbels, originally used as decorative supports, serve as the two large wooden end pieces. These detailed architectural elements look like two giant bookends. A bolted metal seat and backrest span the corbels. Gary also converted a large circular planter and three finials into a fine-looking water feature. He sealed the inside of the planter, making it watertight, and hired a local stone company to drill holes in the three stone finials. Plumbed to a small pump, the finials bubble water from their tops, creating a soothing trickle heard throughout the garden. In the winter, when many plants go dormant, this fountain becomes a focal point. JoAnna found an old English garden tub, originally made so mothers could carry it into the garden to bathe their young children. She adapted the piece as a planter, filling it with colorful flowers. 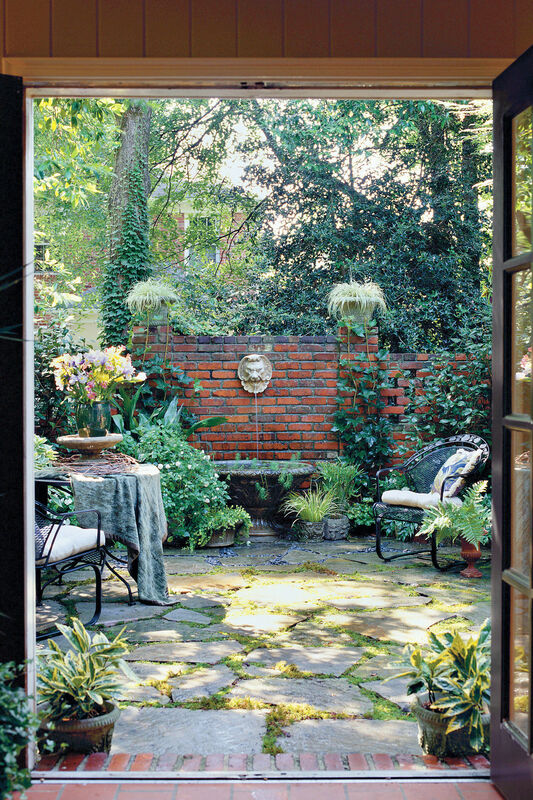 Far from looking out of place, these salvaged items fit in nicely, giving the landscape personality and charm. People walking down the street stand on tiptoe as they pass by, trying to look over the boxwood hedge and see what's in bloom. Neighborhood friends on walks often stop and stay awhile. Such unexpected visits turn into fun gatherings on the small terrace. The Sasnetts' team effort has created a wonderful outdoor room that everyone admires and enjoys. 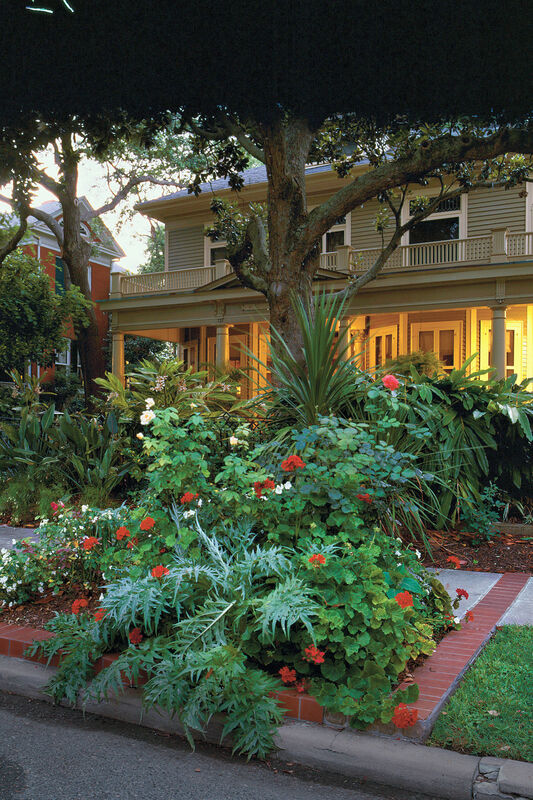 "Colorful Cottage Courtyard" is from the July 2004 issue of Southern Living.